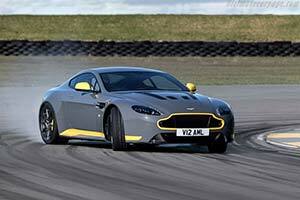 Director of Product Development, Ian Minards said: "We're all enthusiasts here at Aston Martin. Building cars that offer something exceptional is what we do. Technology drives us forward, but we understand the importance of tradition. The true purist will always hanker for the tactility and connection offered by a manual transmission, so it has been a real pleasure to offer just that in our fastest and most focused model. At a time when manual transmissions have almost entirely disappeared in high performance cars, this makes the manual V12 Vantage S a very special car indeed". The seven-speed manual transmission features a classic dog-leg first gear position; an echo from the past that will be welcomed by driving enthusiasts. This dog-leg configuration also ensures the gears used most frequently are located in a double 'H' pattern like that of a conventional 6-speed manual. Offered as a no-cost option, the manual V12 Vantage S is a series production model. Customers simply have to make the choice between manual and Sportshift III transmission when ordering their car. Both versions are otherwise mechanically identical, sharing the same chassis and brake packages and powered by the same 6.0-litre V12 engine. A new Sport-Plus Pack option includes a raft of exterior and interior changes. Foremost amongst these is a choice of five body colours, which can be combined with no-cost optional accent colours applied to the front grille lipstick, side sills, mirror caps and rear diffuser blades. Ten-spoke graphite finish lightweight alloy wheels complete the Sport-Plus Pack's exterior changes, while a choice of black or grey upholstery with stripes and contrast stitching offered in a range of accent colours create a suitably dramatic interior theme. One change to be implemented across all current model lines is the new AMi III infotainment system. This includes a new integrated Satellite Navigation system that offers significant improvements over the outgoing AMi II technology. Key areas of improvement are the integrated graphics, quicker and easier address input, reduced loading times, updatable maps, graphical itinerary planning, advanced traffic information, enhanced map graphics and a greater range of voice guidance options. AMi III also incorporates Apple CarPlay to enable the integration of iPhone functions into the built-in display.